Q. Do birdfeeders encourage non-native bird species? During winter, pigeons, starlings and crows scare off the other species at the bird feeders. How can I discourage these larger birds? A. Certain introduced bird species, such as the house sparrow and the European starling, do cause problems for native species. That is why CWF emphasizes creating habitat through the planting of native trees, shrubs and other plants, as opposed to simply providing bird feeders. It’s unlikely we will ever be rid of non-native bird species. However, by following these tips, you can at least discourage them while helping native species. Offer suet cake in a wire suet holder that can be hung. Pigeons are ground feeders and will generally only feed at sturdy platform feeders. You can also purchase suet feeders that have a wooden top and wire mesh below—the bird can only access them by hovering underneath or clinging to the underside. Woodpeckers can do this, but pigeons can’t. A number of commercial birdseed mixes contain high proportions of hulled oats, rice, peanut hearts, corn, millet and wheat. Avoid these mixes since these ingredients can attract pests such as pigeons, starlings and house sparrows. If you have the space, try filling a number of different feeders with different types of food. If you put a mix of seeds in one feeder it often goes to waste, as birds will eat their favourites and spill the rest. Separating food types and feeders will help give smaller birds a chance to eat without being scared away by larger birds. Many smaller birds, such as finches, don’t require perches, but larger birds do. 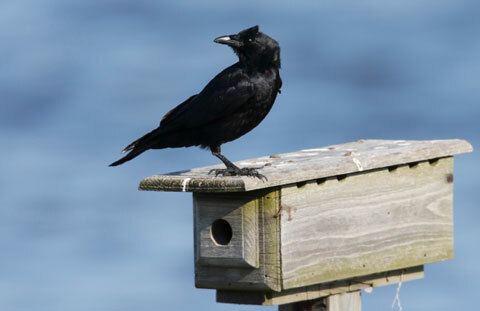 Hang tubular feeders with shortened or no perches to discourage larger birds. Finch feeders with tiny openings for Niger seed don’t allow the larger birds to feed but are great for goldfinches and other small birds. Offer sunflower seeds, since they are the favourite food of purple finches, cardinals, goldfinches, grosbeaks, juncos, chickadees, nuthatches and many other birds. Feed blue jays separately with peanuts in the shell. The large shells of the peanuts seem to discourage pigeons, which are used to eating grains and smaller weed seeds. Use caged feeders that let only small birds in, weight-sensitive feeders and tube feeders with small or no perches. These will all exclude crows in favour of smaller birds.